Live it up like you’re in the Mediterranean with this salad, which is bound to make your day! 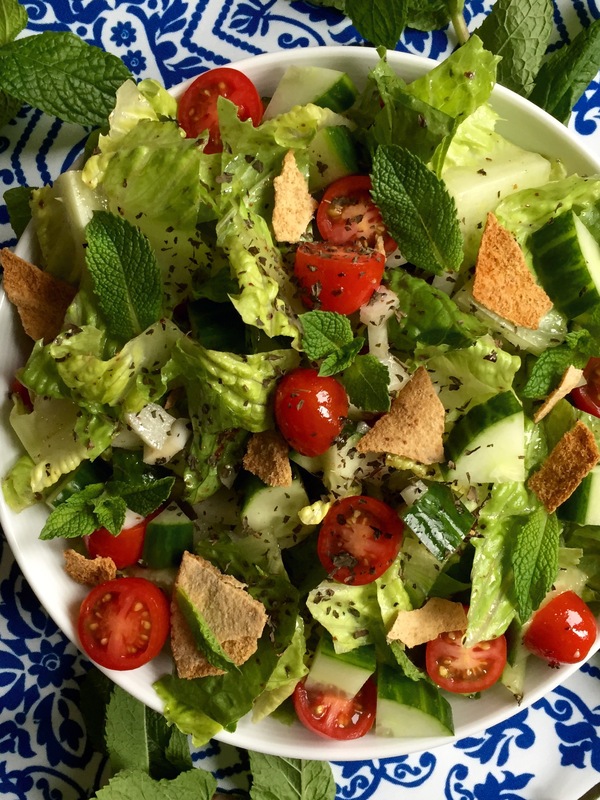 Fattoush is a Middle-Eastern salad which is great in hot weather because all of the veggies that make it up are high in water, making it a hydrating delight (drink your salad?)! It is made with crispy and fresh romaine, diuretic cucumber, astringent onion, juicy-explode-in your mouth tomatoes, crispy oven-toasted whole-wheat pita chips, floral sumac and cooling mint. This recipe has 2 rather uncommon ingredients: sumac & pomegranate molasses. Ground sumac is made by finely grinding red sumac berries and has a floral, tangy and lemony taste. Its citrus-y taste may explain why Ancient Greeks and Romans used to use it as a substitute for lemon or vinegar. It also adds a beautiful color pop and is said to be great for digestion! Interestingly, according to Iranian tradition, for New Year’s, each home must bring to the table the 7 symbolic elements for having a good year, and sumac is a symbol of a good life. If you’re wondering where to find this symbol of good life, it should be available at your local farmer’s market. Pomegranate molasses is a tangy and delicious syrup obtained by reducing pomegranate juice, with or without sugar, to a deeply flavoured syrup. Some choose to increase the pomegranate-ness of fattoush by adding in actual pomegranate arils, which I think is a marvellous idea. Wash, dry and chop up the romaine. Mix all ingredients in a large salad bowl. 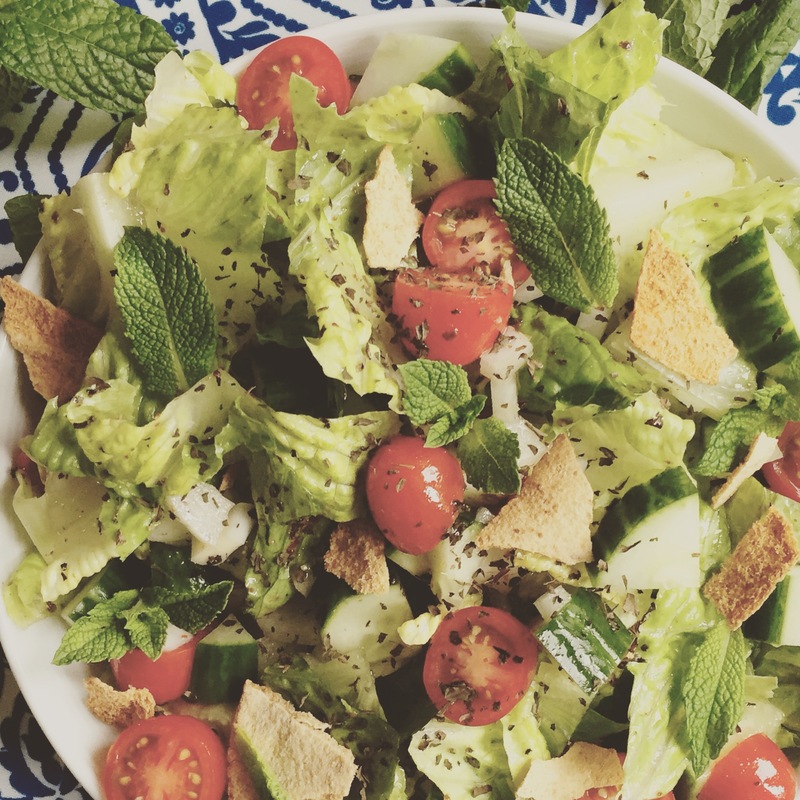 Note: I personally find fattoush best the next day, after having let it sit overnight, so don’t feel pressured to finish it all when it’s fresh, and make sure you enjoy those leftovers! So heavenly. I’ve been fattoushed by an angel.